"there is no reason for the two not to be identical"
I think you might look into replacing *both* brass parts with RP ones. On second thought, if we had thermoset paste with a high thermal conductivity (e.g., graphite-filled silicone resin), we could have each head print nozzles for the other. If I'm reading this correctly, you pump the soda bottle up with air initially, then assume it has enough pressure to finish the job. What effect will the varying pressure as the balloon (very slowly) deflates and have on the feed rates? Will you have to monitor the system and keep it at a roughly even pressure? The volume of extruded paste is extremely small compared with the total volume of the bottle. You'd be looking at a <10% pressure variation. I love the idea of reciprocal head printing. I suspect you'd still have to run an 0.5mm drill through it afterwards, but that's not a serious problem. Vik's right about the pressure change. There's 50 ml of Polyfilla and 450 ml of compressed air. Boyle's law tells you the rest. The paste extruder is very important to me because of its ability to deliver materials with fillers. I would suggest you try running a line from the supply to the extruder rather than having the extruder carry a small supply with it. Line length inst such a large concern since its at room tempature. Then have use a larger syringe with weight attached to the plunger to pressurize the system. Put in a couple of check valves and refilling is just a matter of pulling the plunger up. Place pauses in the program and it should be possible to refill without stopping the build. I can see where stuffing a balloon into the bottle neck would be time-consuming. Seems like a top-loading configuration would be easier. Trying to think of an appropriate container. It'd need to have a large opening with a tight-fitting lid on top and a narrow opening on the bottom. First thing that came to mind was a jam jar (or some sort of canning jar) but you'd need to drill a hole in the bottom. Oh, wait. If you turn the jar upside down, then drill holes in the lid for both the nozzle and the pressurizing valve, then the jar itself remains intact. The lid would be mounted to the head and the jar would be removable. That way, changing out the filler becomes a matter of unscrewing the jar, replacing the balloon, replacing the jar and repressurizing. Can a glass jar handle the sorts of pressure you're using? The problem with using glass is not that it wont handle the pressure, its that when it breaks it shatters. Plastic just tears and releases the pressure. Another possibility would be a length of PVC pipe with screw caps and a air hose fitting attached to the top. Fill the whole pipe with material and just hook up an air line. Not as simple as a bike pump but you can get 10cm PVC pipe and cut to a length of say 1 meter that would hold a huge amount of material. Getting a filled balloon in a bottle is not hard - put the balloon in, then fill it. A glass container's main problem is weight. The Darwin design moves the heads, so excess inertia is not desirable. Also, narrow containers are preferred as the two heads need to sit next to one another. Use a length of balloon inside a bottle, as you have...but but a 'T' fitting between it and the extruder. Now, put a largish syringe with two checkvalves, making your own pump, on a second 'T', and an open container of the stuff upstream. The jug will allow a consistent pressure, (you'd only have to charge the container at the start, as it'd leak a bit,) while the syringe, check valves, and 't' fittings allow you to have a continuous feed of the material. Also, it'd potentially allow you to have a smaller bottle on the extruder, as you could now safely have less material available than it needed to complete the project. You'd still have to come pump more filler into the balloon, though. This can be automated, crudely, with an optoisolator shooting a beam across the top of the balloon, through the bottle. More complex, but it builds on the existing design. If it glitches, you retain (most of) the functionality of the original system. P.S. This it the type of pressure tank I have on my well. We have had limited but significant success with various reprocessable materials, specificly for a final generation k-12 curriculum and kit. Hot Glue, the conventional best case, exhibited hastles with coloration; doping materials discolored and were a major pain to seperate out, and silicon changes state upon reheating, causing a predictable limit of reuse. Combined with fumes and heating elements of silicon, water based materials are more desirable. Wheat and Rice paste (without additional chemicals as white glue and wallpaper glue) work very well for rapid layup, are easily colored upon extrusion with watercolor paints and food coloring, and are technically similar to pasta casting (by hand) in severely limited classroom environments. Pure cellulose based materials are 100% recoverable, boiled with water, and easily seperated from coloring and particulate additives. White Cement (not plaster or others) is also recoverable, typically with a water cannon and physical crusher. Adding various other qualities (towards white glue, normal cement or quickset, machet, and others) are quite simple, and equate to dipping pasta in white glue. The nozzle optimized for this process is also suited for silicon, higher temp polys, the cements and plasters, and water based glues; no less physical extrusion of various pasta types through a coating of glue or coloring mix. Simple requirements: final stage heating and cooling coils, along with coloration/doping additives from a similar set of tubes as the coolant on the exit nozzle freezing or regulating the exit temp of the material. We have been able to decently draw binary (on-off) squares at nozzle resolution with full coloration with very little error, mainly due to the difference between a temp controlled flow regulation rather than a physical cut off. Size of nozzle with all materials and coatings/coloration handled well with water based materials (hint boil glue and flower materials on exit for faster set) is around a half mm, though the feed tubes for color and heavier material are very small. Though pre-staging of material order is an obvious optimization, mixing color and other completely, and allowing mixes of materials in a nozzle would be obvious enhancements. Extrusion of pasta (spaghetti) with wheat paste, color, and a basic cutter before entering the extruder has worked well, but is an obviously different design than the liquid materials. More on this soon, busy teaching kids and robots to play with their balls. 1. Pressurize the bottle slightly to eliminate any air from the balloon. 2. Remove the nozzle tip. 3. Connect an extra piece of silicone tube to that and back fill from a syringe. 4. Close the valve and fully pressurise the bottle. As Vik says, size and weight are serious constraints. The final version needs to be small and light. was common hot glue. now concentraing on organic nontox and consumable material again.. there are many "hobby cake decoraing" systems that extrude various material, even a few that place sugar bead/objects.. best material thus far for mechanical qualities has been a heavy pasta mix of powders, mixed well, and basicly cooked/flashburnt on the extrusion nozzle resulting in a heck of a lot of steam and scent, but close to pet-1 mechanical qualities when all the fuse/bond is consistent. Soda bottles of any standard shape and type are uniform material from any factory.. using a common razor blade on a turnstyle, a square cross section filiment can be easily produced and immediately loaded into the extrusion rig. this means one cutter and rotating bottle, one feed sled/spindles, and all mechanical process (except electrical heating) can be run by one motor and some simple ratcheting/gearing, or even by hand rotating the bottle! Autonomous fab (once the design is standardized) becomes a gearing mechanism based on the material feed rate, and a simple toggle to select the mechanical mode, either reproduce identical, repoduce with a different head control (digital), or select any other standard gearing. pet1 soda bottle (washed) directly fed to extrusion head, heated and mechanically actuated from a central heat source. 3 2L bottles for the next generation each. Really, Wilfred, silicon? Like the element? perhaps instead a ConE for one's head... the mexicans and non-english euros call hot-glue "silicon" rather than something more accurate. Everything we are working with is intentionally macro scale and confirmable by eye, at worst, with common magnifying glass, explicitly not requiring microscope for confirmation. This includes electronic components, wiring, etc. Also most current designs are pneumatic with a mechanical pressure no greater than a small human can overload. blow valves, etc also used. What resolution is achievable at this device? For example, I need to create phase mask with minimal element about 1..2 micrometers. Is it real now or in near future? Anyway, thanks for this interesting investigations! "I need to create phase mask with minimal element about 1..2 micrometers. Is it real now or in near future?" 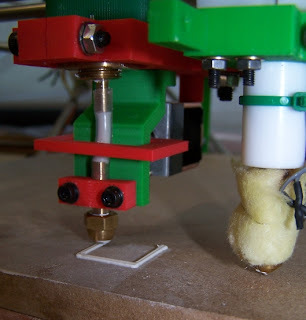 I don't think that anybody is thinking that Darwin or any of the other variations on the RepRap theme are going to be able to do this sort of thing for a long, long time, if ever.